When it comes to the safety and security of your home or business, a state-of-the-art opener/operator is key. At Mountain Air Garage Doors, we supply and install a wide variety of residential garage door openers and commercial door operators to meet your needs. Today's products offer an abundance of features with the reliable performance you expect. Our primary residential brand is Marantec, with LiftMaster, Hormann, and Linear as options. 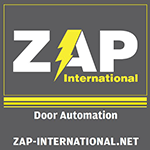 LiftMaster is also our primary commercial brand with top-of-the-line Zap brand operators as options.